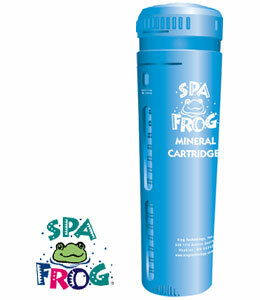 SPA FROG® Mineral Products control bacteria and help keep the pH neutral, which reduces your bromine by up to 50%* and makes the water feel soft and looking crystal clear. 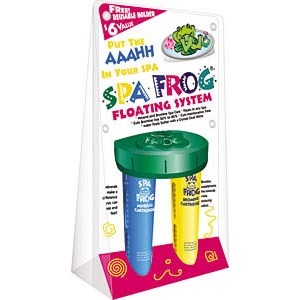 SPA FROG® Floating System uses pre-filled mineral and bromine cartridges that snap into a reusable floating holder and works in any spa or hot tub. 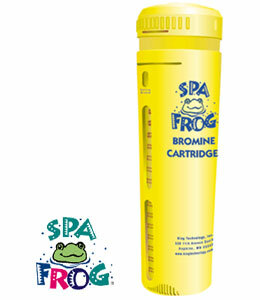 The SPA FROG® Floating System transforms your spa into the perfect environment for soothing relaxation with up to 50%* less bromine than standard bromine spas. Cartridges are easily adjusted to meet the sanitising needs of any size hot tub or spa. Replace the mineral cartridge every 4 months when you drain and refill your hot tub or spa. The bromine cartridge will last 2-4 weeks depending on use.